Absolutely agree, except it appears he's pretty good in the slot, which is super important. Don't put the guy deep though. Good article, I agree. He is no way near being a bust, as evidence shows, he played well when playing to his strengths. T-Sizzle leaving the Ravens for... the Cardinals. First thought, Ravens missed their chance to replace him with Fowler! Second thought, Arizona adding a second veteran edge rusher to play opposite Chandler Jones means they're likely not taking Bosa which means they're definitely taking Murray, right? Andrew Luck has a new target: The Colts signed WR Devin Funchess, formerly of the Panthers. You gotta wonder what the Colts see in a guy who had trouble catching the ball (five drops vs the Lions -- ooof) and getting open. But then again Eric Ebron was a zero with Detroit but had a career season in Indy last year. Weird. Gonna be real weird for him to be in a different uniform. Frank Gore going to Buffalo. And DeSean Jackson gets his wish and goes back to the Eagles. Yeah, Luck and Company get the benefit of the doubt after turning Ebron into a monster. Packers add Za'Darius Smith + Adrian Amos. Obvious caveat is what kind of $$$ but double thumbs up for defensive additions. 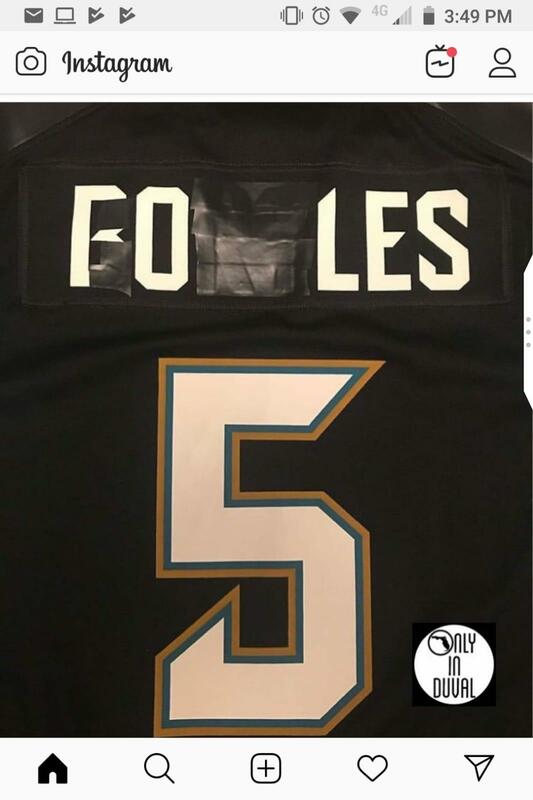 Jags fans reduce, recycle, reuse. The Steelers did something right this offseason. They certainly needed that, but thank you for adding to the Ravens' compensatory picks for next year. Well, when you have to buy new jerseys every other year due to the tremendous turnover of your franchise then you have to get creative to save a few pennies somewhere. [Well, when you have to buy new jerseys every other year due to the tremendous turnover of your franchise then you have to get creative to save a few pennies somewhere. CJ Mosley signing with the Jets. Ravens defense has now completely evacuated Baltimore. Breshad Perriman is back in Cleveland for another year, so the Baker-to-Breshad connection gets to entertain us for at least another season. I'm bored now, I need more things to happen. Bryan Anger (not fixing that typo) is being let go from Tampa. I don't know if you recall, but he was a 3rd round pick by the Jaguars. And they're replacing him with another drafted punter, Niners 2015 5th round pick Bradley Pinion. I actually thought his last name was Unger. I'm tired. Stupid DST. Go to the metal thread already, Legion. I called you out in it. How would Ezekiel Ansah fit on the Chiefs? Seems like they need at least one 4-3 DE. I am f'in livid right now. I have no words. Legitimately the worst run organization in the league right now. Gettleman and Mara need to be prosecuted. Landon Collins and Odell Beckham are gone. Eli Manning is still here. That's an offer too good for the Giants to refuse. A mid-1st, a 3rd, and a good box safety that steps in and instantly replaces Collins at a fraction of the price? They're in position to draft Haskins and one of the best WRs in the draft. Browns are going hard on the "go all-in while your QB is on his rookie deal" strat. Jeez, Legion, are you bored now? I was going to pop in to report that linebacker and Panther-for-life Thomas Davis has signed with the Chargers but then I saw the Odell news and thought, meh. @ Tempest: Speaking as someone who lived through David Gettleman's last GM stop, I'm not surprised at all that he unloaded Beckham. Gettleman likes a nice calm locker room, and Odell is nothing but drama. I am entertained, Maximus Decimus Meridius. This is going to be great! Go Browns! Niners and Chiefs reportedly in trade talks for Dee Ford that are expected to go "deep into the night". Ford is franchise tagged and a trade is contingent on the Niners and Ford negotiating a contract first, so apparently that's happening. So I am going to need this trade to sink in...One thing I am tired of is this organizations ultra loyalty to Eli. He helped win two championships and being around when the Gmen had their lot of QB's since Simms was painful but they need to get a replacement. Ian Rapoport is on NLFN saying OBJ is looking to get the kind of contract "considerations" that Antonio Brown got from the Raiders - in other words, more money added on to his current years. This might be getting even more expensive for the Browns. One thing I am tired of is this organizations ultra loyalty to Eli. His replacement is getting drafted on day 1. Getting rid of OBJ is not something a team does to maximize their 38-year-old QB's final chances. Giants are blowing it up and starting fresh.